A man has been sentenced to life in prison for killing a shopkeeper. Words cannot even begin to describe how difficult the last 18 months have been for the family. The shock, distress and pain of suddenly losing a member of your family in the most difficult of circumstances is very difficult to comprehend. Nobody can understand just how heartbreaking and soul-destroying it is to come home and find your parents in tears night after week after month in the knowledge that there is nothing you can do to assist. There is no doubt in my mind that the individual responsible for this crime is an evil, cold and pathetic coward who clearly has no respect or dignity towards other members of the public. As a result of his actions there will always be a permanent gap that will never be filled again. Today marks the end of the formal proceedings and I welcome the closure that this will hopefully bring to the family. With reference to today’s proceedings there are no circumstances whatsoever in my mind that may justify an individual convicted of taking the life of another person even being considered for early release or placement within an open prison. The time has surely now come for our Members of Parliament to be accountable to the public and launch an urgent and immediate review of the various elements of our Justice System, with swift legislation to address the changes sought. I would, however, like to end this statement on a positive note. One thing that has become clear is that for every undesirable individual we harbour in society there are hundreds (if not thousands) of warm, affectionate and kind people who make up the vast majority of the Scottish public. On that note the family would like to issue their thanks to a number of people. Firstly a thank you to all the medical staff who fought so hard to save the life of my brother, starting from the ambulance service to all the hospital staff. A large thank you must go to all members of Strathclyde Police, whose professionalism and determination were evident from the first moment. Thank you to the Crown Office, whose immense effort and commitment resulted in not only justice but also some closure to this incident. A large thank you must go to our employers, colleagues and ex-colleagues, who have shown (and no doubt will continue to show) exceptional understanding and support. And lastly, the largest thank you to the largest group. Quite simply, the family have been overwhelmed at the sheer volume of cards, flowers, letters, visits, calls, texts and general positive support that have been shown to date. All of these sources of support have been of great comfort. I would like to end this statement by requesting that the press respect the privacy of the family and now be left alone in peace in order that we all may attempt to move on with our lives. November 2006. The community of Maybole was stunned last week to learn of a murder in their town. Everyone was shocked to hear of the death of Amjid Ismail who was working in the family shop in Kirkland Street, and a book of condolence has been opened to allow townspeople to record their sympathy. The book was opened after the Remembrance Sunday service in the Town Hall and will remain open for the rest of November and then handed to the family. Cathy Jamieson MSP said: "Like everyone else, I was appalled by the news and my thoughts are with the Ismail Family at this very sad time. I've been contacted by members of the local community who are stunned by this tragedy. Maybole is a very strong community and people have rallied around the family. I am in close contact with Strathclyde Police and the matter is now in the hands of the courts." 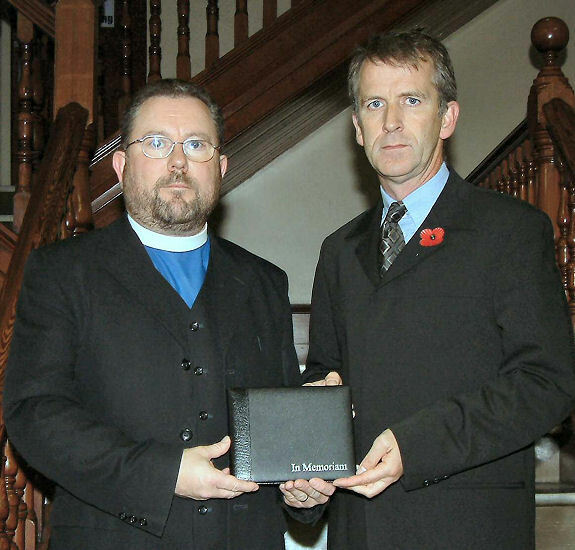 Rev John Stuart, former minister of Maybole West Church, has also been in touch by e-mail from the Unites States to say, “I was absolutely stunned to read about the murder in Maybole. The family of that young man have always been supportive to the Maybole community and I can remember several times when the shopkeeper helped out families in the town when they underwent times of crisis, grief, and tragedy. I know that the whole community of Maybole will express their deepest sympathy to this family and show them compassionate love in the midst of their sadness.” He asked Mr Kiltie to pass on his message and tell the family that they are all in his prayers. Flowers were laid near the shop, prayers were said in local churches, and the family received flowers and many cards as the community rallied round them.